Quote, unquote: Bells & whistles. Take your pick. Both quotes from the same article in Adweek concerning major publishers cranking back expensive, media-rich features on tablet editions. Some have decided to put the emphasis on being on as many devices as possible. -- Steve Sachs, executive vice president of consumer marketing and sales at Time Inc.
-- Rebecca McPheters, president, McPheters & Co.
Canada's History Society, the publishers of Canada's History magazine and Kayak, the children's history magazine, has announced an expanded Governor General's History Awards that will be presented to 21 Canadians in Ottawa on December 12. The awards, created in partnership with the Canadian Museums Association, the Canadian Historical Association, Historica-Dominion Institute and the Begbie History Society, will be presented by His Excellency the Right Honourable David Johnston, Governor General of Canada. They are intended to bring greater profile and recognition to the value of historical research, education and public interpretation. Since 1995, Canada's History Society has presented the Governor General's Awards for Excellence in Teaching Canadian History and the Pierre Berton Award for popular history. Duncan Hood, the editor of MoneySense, last year's magazine of the year at the National Magazine Awards, is moving within Rogers Media to be the editor of Canadian Business, effective January 1. A memorandum to staff from editorial director Dianne de Fenoyl (to whom Hood will report) credits him with leading MoneySense's 36% year-over-year newsstand growth. Hood succeeds Steve Maich, who moved over in August to launch the new Rogers magazine Sportsnet as publisher and editor-in-chief. The number of "action codes" (Quick Response (QR) Codes or similar) in use by magazines is growing dramatically. According to a study released by Nellymoser, Inc. (reported in Folio:), the number of magazine action codes rose 476%, from 88 in January to 507 in September, with 1,155 action codes printed in Q3. The study was based on data collected from the 100 largest circulation U.S. magazines. Not surprisingly, advertising accounts for most of the growth; by September, there were 20 advertising related codes for every editorial one. “No single category or reader demographic dominates the list of top magazines containing action codes,” the study says. “This indicates that editors and advertisers are using action codes to reach a wide audience. Women’s magazine titles, which focus on fashion, family and homemaking, continue to outnumber other titles as they did in Q2.” In total, tags in the beauty, home and fashion categories represent about 38 percent of all codes use in advertising. 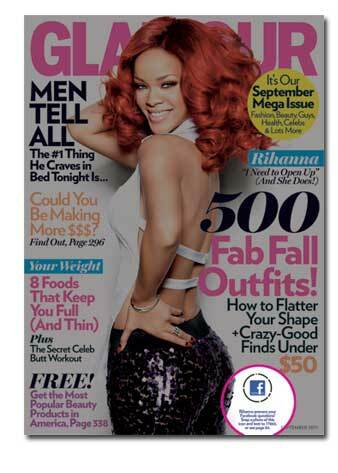 The survey highlighted one magazine using the codes aggressively to build editorial following. Sports Illustrated uses action codes every week to drive readers to see a video featuring a Q & A with a selected athlete; readers can submit their own questions for future interviews. 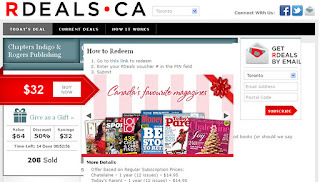 [This post has been updated] One of the first deals Rogers Media is offering on its brand-new R Deals site is two Rogers magazine subscriptions for $32 plus a $25 gift card from Chapters. According to a story in Marketing magazine, R Deals is similar to services being offered by Torstar (WagJag), Postmedia (SwarmJam). “We’re going to differentiate around more personalized, higher quality deals and merchants,” [he said] “We have a high-quality audience… To be able to leverage the audience of Chatelaine, Flare, Maclean’s and SweetSpot.ca, building our deals based on those customer databases, is a big deal for the [partnering] merchants....“It’s not necessarily going to be an editorial product, but say if someone reads an article in Lou Louon clothing, we’ll smartly tie-in a deal.” Tafler noted, however, that deals will be clearly marked as advertising as opposed to editorial product. The site says the value of the deal is $64 and the discount 50%. However it also reveals that this is based on regular subscription prices ranging from $14.95 to $19.99. For the two most expensive subs (MoneySense at $19.99 and French Châtelaine at $19.97), the sub portion of the deal would be $39.96. With the gift card added, the deal indeed totals $64.96. But take two $14.95 subs, such as Flare or Today's Parent and the sub portion would be $29.90. Plus the $25 gift card, the true value of the deal totals $54.90 so the deal is discounted 42%. The Canadian Medical Association Journal has tapped into a deep sense of outrage in a somewhat unlikely way with an editorial in its current issue that suggests hospitals should abolish parking fees. The editorial, by Rajendra Kale, the interim editor-in-chief and a neurologist at an Ottawa hospital, says that parking fees at hospitals are a barrier to health care, put an added stress on patients and their families and should be discontinued. The editorial was dismissed by Tom Closson, the CEO of the Ontario Hospital Association, who called it a waste of space in the magazine. He was quoted in a story from Canadian Press. If hospitals scrapped parking fees they would have to make up the funds some other way or cut services, said Closson, who previously ran several large hospitals, including Toronto's University Health Network and Sunnybrook Health Sciences Centre. Or they would have to ask the provincial government for more funds, he said, predicting that wouldn't fly at a time when the province is already running a deficit. The CP story provoked a blizzard of comments -- for instance personal anecdotes about being fined for overstaying a meter while being at a sick family member's bedside. RedPoint Media Group of Calgary says it plans to double in size over the next five years and become one of Canada's largest content creation companies. Gary Davies, the executive vice-president, told the Calgary Herald that technological change has led the 15-year-old company to evolve from being a magazine publisher into a multimedia content creator and custom publisher across multiple platforms. "We have led through our own products - Avenue (Calgary and Edmonton) and Wine Access - and we have led through the work we do for our clients as well as through the magazines we produce, and more recently, through the content that we provide for our clients' web sites and newsletters," says Davies. RedPoint has recently joined forces with Calgary Economic Development to develop a national marketing and business development campaign called "Calgary: Be Part of the Energy", which is designed to attract people and business to the city. The campaign will appear in various publications such as Avenue and up!, the WestJet inflight contract published by Redpoint, as well as through various online media extensions. A good party and a great magazine; doesn't get much better than that. The students and faculty involved in the Ryerson Review of Journalism are launching the Winter 2012 issue at the Cadillac Lounge, 1296 Queen Street West in Toronto from 5:30 to 9 p.m. on Thursday, December 8. A visual makeover of East Coast Living magazine and its companion website have paid off big time, according to a release from the magazine, which won the 2010 Makeover Contest sponsored by K9 Design, a leading Canadian design firm in Toronto. The new logo, cover and interior layout for the quarterly homes and lifestyle title seems to have strengthened ad revenues, which have grown by 20 per cent since 2009. “East Coast Living now has a stronger look and feel and our new contemporary design is catering to our core group of readers but also to younger, urban readers, which is very exciting,” says publisher Patty Baxter. National advertising grew from 15 per cent in 2009 to 27 per cent in 2011. Traffic on East Coast Living’s website, redesigned by Halifax design firm Kula Partners last year in conjunction with the makeover, has doubled, with a 232 per cent increase in unique visitors and a 214 per cent increase in total visits. Norm Lourenco, founder and creative director at K9 Design, is amazed with the results. “For East Coast Living to have accomplished this level of success proves that when you have the right message married with the correct visual language, it creates a powerful product,” he says. The thorny problem of sponsored editorial will be explored at a luncheon panel being held by the Canadian Society of Magazine Editors in Toronto on Thursday, December 1. Maureen Halushak of Glow, Andrea Kolber of Canadian Living and Matthew McKinnon of The Walrus will be talking about how to keep your integrity while accepting the advertisers' dollars, observing the ad:edit guidelines and bringing in new and much-needed revenue. The lunch is at Carr Hall, 100 St. Joseph Street (east side of Queen's Park) and begins at noon. It's $25 for CSME members and $40 for non-members. It's highly advised to register in advance because space is limited. Lauren McKeon has been named editor of This Magazine. She has been the front-of-the-book editor for the magazine for two years and now replaces Graham Scott, who is leaving after a little more than three years as editor to pursue other endeavours. This Magazine this year celebrated 45 years of publication. There's a new (or, at least, relaunched) online magazine out of Vancouver for men over 50 called Wisdom Fishing. It first appeared last spring, but had come teething troubles and, as reported by the Vancouver Sun, now it's run by a new editorial board of four guys who fit the specs (as do I) for the site: Bob Foulkes, Bob McCaskill, John Skinner and John Swift. Skinner, a recently retired editor at The Vancouver Sun, is the editor; a note in the latest issue says he "provides adult supervision". "We have choices: We can live the last third of our lives in many ways. Men over 50 encounter new challenges and novel opportunities [a release says]; paths taken, paths not taken and paths to be taken. WisdomFishing.com will be about choices and about how to live without regrets"
The site contains an article “Ten books every man should read.” by former Sun editor in chief Ian Haysom, who has a weekly column for the Victoria Times-Colonist and is news director of Global B.C. Haysom’s top 10 include Bullfighting by Matty Doyle, Fever Pitch by Nick Hornby and The Old Man and the Sea by Ernest Hemingway. Another column by John Swift explores a father’s poignant feelings about his daughter marrying. 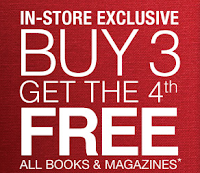 Indigo Books and Music is offering to sell any four magazines for the price of three as part of its "Black Friday" weekend in-store promotion, advertised in various papers and on now through Sunday. This effective 25% discount (depending on the cover prices) applies to all books and magazines (some restrictions apply). This "buy 3 and get the 4th free" initiative by the cross-country chain raises the question again why magazines can't use discounts and off-price promotions more often on newsstands. We have no "day-old bread" discounts, for instance, and don't slash the price of last month's issue once the latest issue is released. Of course Indigo has the means to manage this and is principally aiming at selling books at a cut price, but the principle is the same. I'm not keen on seeing magazines devalued, but if you were going to be buying single copies of magazines for the Christmas morning stockings and an Indigo store is nearby, this is a great deal, particularly as the holiday issues of most magazines are in-stores now. The Globe and Mail has dipped once again into the world of magazines for talent, this time to drive its content marketing and "branded content" growth. Charlene Rooke, who was editor-in-chief of Western Living magazine and most recently was executive editor of custom brands at custom publisher Spafax Canada has joined The Globe in the newly created role of group editor, custom content group. She will lead the overall strategy for custom and branded content initiatives, reporting to Teena Poirier, who has been appointed to an expanded role as director, content marketing. 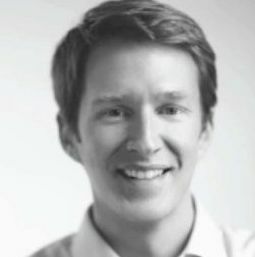 Also promoted is Simon Beck to senior editor. He will continue to be responsible for automotive content. Recently, The Globe hired away the founding editor of Swerve magazine at the Calgary Herald, Shelley Youngblut, to become its western editor. Members of the Magazine Association of BC are being asked to take part in a consultation about setting up a web-based Collective Online Advertising Network. A member consultation session will take place Wednesday, November 30 at 827 Cambie Street in Vancouver from 10 to 11:30. Arrangements will be made for out-of-town members to participate by conference call. According to MABC, the primary goal of the initiative is to enhance advertising opportunities for participating titles, maximize revenues and minimize costs of administering and managing the proposed network. Just a gentle reminder to publishers that there is a little more than two weeks until the deadline for application to the Canada Periodical Fund's Aid to Publishers component. Chuffed by its impact as the originator of the worldwide Occupy movement, Adbusters magazine is ramping up its annual Buy Nothing Day into a new campaign called "OccupyXmas". On its website, the Vancouver-based magazine is calling on consumers to buy nothing for Christmas this year. The campaign starts tomorrow -- so-called "Black Friday" in U.S. retailing, the day after U.S. Thanksgiving, and on Saturday in Canada and worldwide. People from the Occupy movement will engage in "pranks and shenanigans" he said, including mall sit-ins, flash mobs, credit card cut-ups and putting up posters. With the momentum of the Occupy movement behind it, Buy Nothing Day can be a “much more powerful curve ball into consumer capitalism” than it has been in the past, he said. Transcontinental, the publisher of many of Canada's largest consumer magazines, has rebranded and its magazine publishing arm will be known as TC.Media and the parent company will be TC.Transcontinental (the printing division will be TC.Transcontinental Printing). "Our new brand launch is a logical milestone in the disciplined roll-out of the development plan we began implementing in 2008 to strengthen our core operations and build new marketing communications services," said François Olivier, President and CEO of TC. Transcontinental. Beyond the truncation of the word Transcontinental, the ‘t’ in the new ‘tc’ stands for technology, while the ‘c’ represents community. In the chosen typography, the bold, upright ‘t’ embodies confidence and solidity. The ‘c’, with its generous opening, signifies willingness to communicate. The red dot from the former logo is transformed into a black one, which represents the digital economy as well as the point of contact between the company and its customers. The logo is black or white, depending on context and usage. Keeping the main typographic element devoid of color will allow the use of various colors to illustrate sub-brands. The Calgary Herald has announced the new editor of its award-winning weekly magazine Swerve and it is promoting from within. Valerie Berenyi, most recently a senior features writer and founding editor with the Real Life section of the paper, steps into the role pioneered by Swerve's founding editor, Shelley Youngblut who, after five years, left the post to become western editor for the Globe and Mail . "Magazines are my first love and I'm thrilled to be joining such a talented and dynamic crew," said Berenyi. "Swerve has become such an essential part of the city's cultural scene." According to a survey by GfK MRI, 11% of U.S. adults' exposure to magazines is exclusively via digital platforms, reports paidContent. And with the proliferation of digital newsstands (Apple, Amazon etc.) the number is likely to grow. Between March and October 2011, GfK MRI estimates that the total U.S. gross magazine audience (the number of consumer exposures to magazine-branded content on any platform, including print) was 1.58 billion. Of those, 135 million exposures were print + digital, and 166 million were digital-only. That digital-only group is made primarily of men (63 percent), and they’re more likely to be young, affluent and well-educated. The sample size for this survey was 12,546 people, and GfK MRI extrapolates its results to the entire U.S. adult population. 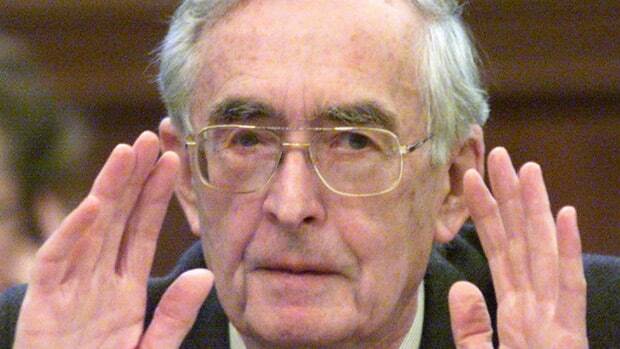 Tom Kent, the founding editor of Policy Options magazine, has died in Kingston at the age of 89. Kent is perhaps better remembered as the chair of Royal Commission on Newspapers (popularly known as the Kent Commission) in 1980-81 (which his death notice mentioned was the only such commission to meet its deadline). Kent was a prolific and energetic civil servant who played a large part in the creation of Medicare and the Canada Pension Plan and in developing the points system for assessing new immigrants. Born in the north of England, Kent was a code-breaker during the Second World War and later an editorial writer for The Guardian and the Economist before emigrating to Canada in 1954 to become editor of the Winnipeg Free Press. Kent is credited with helping Mike Pearson rebuild the Liberal party in the early '60s and a paper he wrote for a Kingston conference in 1960 formed the blueprint for the Liberal revival that made Pearson prime minister. Kent served as a senior advisor to Peraon and became deputy minister of regional expansion. Later, he left Ottawa to take over the Cape Breton Development Corporation(1970 - 77), Sydney Steel (1977-79) and then became dean of administrative studies at Dalhousie University in Halifax (1980-83) and an adjunct professor in the School of Policy Studies at Queen's University in Kingston. At about the same time, he helped launch Policy Options. He was named a companion of the Order of Canada, the highest rank, in 2001. Transcontinental Media is launching a multi-media brand called Juice, including a 400,000 controlled circulation print magazine. The magazine, taglined "healthy living made delicious" will be delivered though Loblaw Companies Limited, with some copies mailed to selected loyal customers and the remainder sold by single copy in select Loblaw stores and other retailers. Editorial content will be developed, produced and distributed by Transcontinental Media, with the focus on providing consumers with delicious recipes and meal ideas, the latest nutrition news as well as practical health and financial advice. Pierre Marcoux, Senior VP, Business and Consumer Solutions Group at Transcontinental Media, stated [in a release]: "We are thrilled to launch an integrated media brand that will be the must-have resource for Canadians wanting to achieve a healthier lifestyle. We expect it to be one of the most innovative publishing launches the Canadian market has seen in many years". The announcement of the launch comes in the wake of the recently announced closure of Homemakers magazine, which was heavily focussed on food and healthy eating. And everything old is new again. Loblaws carried an upscale, full-sized contract published magazine called Presidents Choice in the late-'90s, created by Zaxis Publishing of Toronto. The idea was to duplicate the success of the Sainsbury magazine in Britain, but PC only lasted a few years. Corporate Knights Inc., publishers of Corporate Knights, the Toronto-based quarterly about corporate responsibility, today announced that a group of investors, led by Vancity Community Capital, is backing a new division called Corporate Knights Capital. The division intends to create and market a suite of investment products themed around "clean capitalism" and drawn from the magazine's published rankings of "green" companies. With the creation of the new enterprise, Corporate Knights co-founder Toby Heaps moves into the role of CEO of the parent company, Corporate Knight Inc.
Corporate Knights Capital, the investment arm, will be led by a team of executives chaired by Nicholas Parker, the co-founder and chair of the Cleantech Group Inc. Other members will be Tyler Hamilton, editor-in-chief of Corporate Knights and currently a business columnist for the Toronto Star, Doug Morrow, the vice-president of research at Corporate Knights, Susan McLean, a senior adviser to Corporate Knights Capital and Diane Hadad, its chief marketing officer. Dauphin Media Group, until recently the Toronto-based contract publishers of Holmes magazine, has been selected by the National Football League (NFL) to publish NFL Magazine. The decision has prompted some head-scratching among U.S. media types who have never heard of the company. Despite how peculiar the choice of Dauphin may seem, NFL vp of media strategy and development Kevin LaForce defended the partnership, telling the [New York] Post, “It’s a small shop out of Canada. We did our diligence and we feel comfortable they can execute.” He added that, under their licensing deal, Dauphin will pay a fee and share ad revenue with the NFL. The magazine’s first issue debuts next month. The Post reported that the monthly magazine will have a distribution of 400,000 copies and a cover price of $4.99 and a subscription at $19.99. 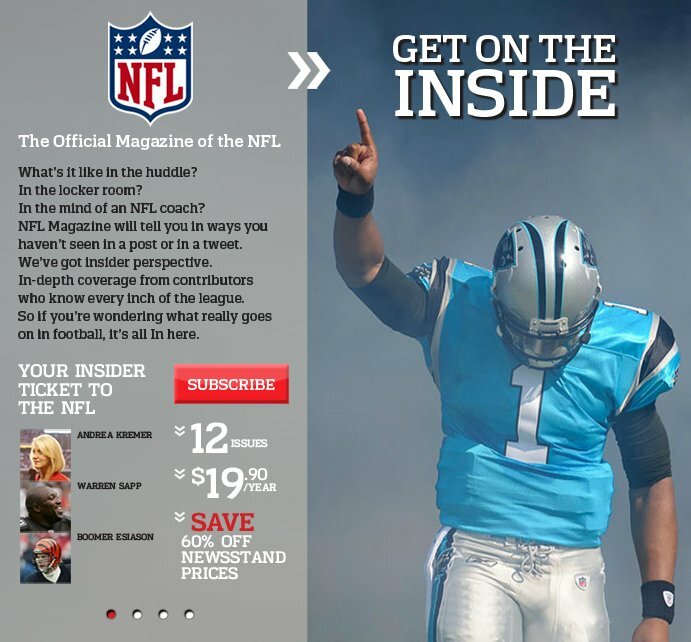 "Every issue of NFL Magazine will offer advertisers a unique vehicle for accessing avid NFL fans. 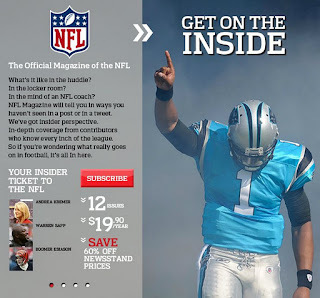 We have more than 180 million fans who spend nearly two hours each week reading about the NFL; as the League's magazine, NFL Magazine will provide fans with unparalleled access to the game of football." Dauphin Media also publishes Canadian Architecture & Design Magazine and had announced last October that it was intending to launch a men's magazine called The Male Perspective. The company opened a New York office last January on the strength of the success of Holmes (launched in November 2009) in both Canada and the U.S. However a dispute apparently over royalty payments and distribution reporting led Dauphin to suspend Holmes effective December. The Holmes Group is looking for a new publishing partner. -- Ziff David Enterprise CEO Steve Weitzner, expanding on the company's decision to go 100% paperless starting in January on eWeek, CIO Insight and Baseline, which have a combined circulation of 400,000. Azure Publishing has appointed Anne Wetheral, former national advertising director at Flare, as advertising director. Wetheral will manage advertising for two titles – Azure, the bimonthly international contemporary architectural and design magazine; and Designlines, a consumer title devoted to design, architecture, fashion and city culture. A content-sharing deal has been struck between The Hockey News (Transcontinental Media) and Yahoo!, Canada's largest sports site. The result, according to a release, will be cross-posting of The Hockey News content on Yahoo! Canada Sports and Yahoo! 's hockey coverage in the magazine. "We are very excited for this partnership," explained Caroline Andrews, group publisher of The Hockey News. "Marrying these two brands ― Yahoo!, the number one sports site in Canada,2 and an iconic brand like The Hockey News — ultimately results in a win-win situation for our readers by allowing us to deliver the most comprehensive hockey coverage in North America." 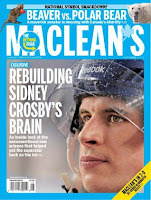 The Hockey News will be carrying material from a leading Yahoo! Canada Sports hockey blogger. Greg Wyshynski (creator and editor of "Puck Daddy") as well as Same McCaig (NHL editor for Yahoo! Sports) and Yahoo! writers Nicholas Cotsonika, Sunaya Sapurji and Neate Sager. The Canada Revenue Agency's charities directorate is inviting public comment on its proposed Guidance on Arts Organizations and Charitable Registration. The deadline for such comments is January 12, 2012. This appears to be a genuine opportunity for arts and cultural magazine publishers and magazine organizations regionally and nationally to influence the way the charities directorate interprets the law as it relates to charitable registration in Canada. While it requires some work, the effort may (we say, may) be repaid with greater clarity. The application and interpretation of the Income Tax Act and various related common law decisions over more than a century has often resulted in decisions that are opaque and infuriatingly arbitrary. One not-for-profit literary or cultural magazine might get charitable status while another, very similar, publication is denied, even though any sensible citizen would declare that both meet the requirements of being involved in "educational" activities of public benefit. (They are most certainly not in business for the money....) The ability to give charitable tax receipts to individual and corporate donors can make a significant difference to fundraising success. From time to time, magazines or their foundations with existing charitable status even have to defend themselves from attempts to withdraw the status. And some magazines have had an expensive, multi-year struggle to achieve charitable registration. The CRA has always maintained that every application is judged on its own merits and that none are precedents for others. The proposed guidelines may go some way towards better defining the rules, so the language and its interpretation is very important. Part of the problem is that there is no specific rule book, no law of charity in this country and interpretations and rulings are made within the charities branch in what often a giant game of "Guess what we're thinking." The fact that a 21st century magazine can see its charitable status denied on the basis of an 1891 decision from Britain can cause considerable gnashing of teeth. The Alberta Magazine Publishers Association has found an interesting way to serve its far-flung constituents by offering a morning seminar in Calgary followed by a province-wide webinar in the afternoon on Monday, November 28. The topic: mining print content for digital traffic and profit. The seminar and webinar are to be led by Joy Gugeler former editor-in-chief of Suite101.com, NowPublic.com and Orato.com; an editorial board member of Quarry, ARC and Room magazines who also teaches publishing and digital media at VIU, Ryerson and SFU and operates Chameleon Consulting. The seminar is from 10:30 a.m. to noon at Memorial Park Library and costs AMPA members $12 (non-members $22). The webinar runs from 2:30 to 4 p.m. and costs AMPA members $22 (non-members $32). Friday evening November 25 will see the launch of Bag magazine in Vancouver. It describes itself as part monograph, part magazine, with each issue dedicated to the work of one emerging artist. The 40 pages are printed on cheap newsprint in a limited edition of 250 copies, signed and numbered by the artist and enclosed in a cellophane bag. In addition, 250 unnumbered copies will be available at various locations. The inaugural issue's cover is hand-stamped because of fears by the printer's lawyer that the original cover was attempting to be passed off as another publication, WE magazine. But the publishers say this has the benefit of making each copy unique. The magazine launch is being done in conjunction with an art show called We Will Buy Your Dreams by Devitt Brown (who is the first issue artist) in the Dynamo Gallery, 142 West Hastings (2nd floor) in Vancouver, starting at 7 p.m.
Below is a video showing the artist hand-stamping the cover. Bag No 1 from Michael Mann on Vimeo. A cheesed-off retailer in Stockport, UK has put up a colourful poster in his store warning magazine shoplifters that he knows who they are and intends to get tough on them, according to a post on Jon Slattery's blog. Is there any example in Canada of a retailer doing similar? Most British single-copy sales outlets work on a "standing order" basis with their customers, though freestanding singles are available on newsstands. Closed-circuit surveillance is also ubiquitous. In the antiquated Canadian consignment business (and the U.S.) it's highly unlikely to know that magazines are being stolen, let alone which ones, or to do much about it. We note, with amusement, that one of the magazines stolen is called Pick Me Up. Martin McColl is a chain of some 1,250 convenience stores and newsagents throughout England, Scotland and Wales. Magazine publishers must look with wonder, and a certain amount of dread, on the $315 million deal by Indigo Books & Music to sell its 44% share in e-reader Kobo to Japanese e-commerce firm Rakuten. Thereby, Indigo makes a tidy return on its initial investment in the business, but gets out before the necessity for $100 million plus in capital that would be required to continue to play against large, global participants, according to an interview by Jordan Timm of Canadian Business with CEO Heather Reisman and Kobo CEO Michael Serbinis. The dread may be because Reisman makes it even more clear that Indigo is moving away from the print-on-paper business to be some other sort of business altogether. While publishers continue to rely on Indigo for its dominance in the single copy sales business, Reisman's thoughts clearly continue to be elsewhere and that can't be good. We must and will fundamentally transform Indigo. The idea of a book retailer as it existed up until the last two years—that option no longer exists. We did two things two years ago: we made the decision to commit to Kobo, and we also made the decision to fully transform Indigo into a whole new kind of retailer and e-tailer, and we are on that track right now. And there’s no doubt that some of that money will be used in that transformation process, both digitally and physically. We caught the wave on e-reading and had a tremendous success with Kobo. I see Indigo as that kind of innovative platform, and we'll do it again. Whether that innovation includes, or squeezes out, the newsstand is something that will be of very real concern to magazine publishers. Indigo's trajectory over the past two decades was to decimate the independent and small chain bookstore sector; it is no longer there to backstop the magazine single copy business when (if?) Indigo loses interest. New frontiers in oversized publishing: The latest issue of Visonaire, a New York fashion magazine, measures 5 x 7 feet and set a new, world's record. Co-founder Cecelia Dean, interviewed by NBC New York's Thread blog, said of the project: "At first, we were thinking, 'It's just a really big magazine, how hard can that be?' " Harder than they thought. They had to get special paper that wouldn't rip as you turned the pages and printing had a lot of handling as each page was printed then moved and flipped by hand. "It becomes so laborious, and that's something you can't know until you start production. It really requires a huge amount of human attention. In a really funny way, it ends up being very couture, I think." Visionaire is not so much a periodical as a publisher of exclusive, numbered limited editions, featuring a different theme and format with each of its three annual issues, not all of which are quite as humongous as the "deluxe" "Larger than Life" issue, which costs $1,500. There is a standard edition, about half the size, for a mere $375 (or $500 for a standard two-issue sub including #61) they treated this more as a one-off art project. The magazine chose to use Lady Gaga as their cover model because she was a "larger than life" personality. There's a video on the website showing the magazine on a New York newsstand and being printed. Brandon Kirk has been promoted from being associate publisher of Rogers Consumer Publishing's new Sportsnet magazine to be vice-president of corporate sales, effective immediately. 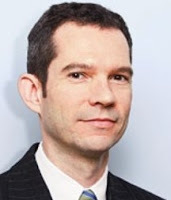 Previously he had been director of sales and marketing solutions at Spafax. Juliette Baxter has been named editor-in-chief of St. Joseph Media's recently acquired titles Glow and Pure. It's something of a homecoming for Baxter, who began in magazines as an associate beauty editor at Fashion and has since worked at Flare and at the contract-published Rouge magazine (Procter and Gamble) for Totem, the contract publisher. St. Joseph was awarded the contract in September to publish Glow and the French language Pure on behalf of Shoppers Drug Mart after 10 years of it being published by Rogers Publishing. The 8-times a year Glow has a circulation of approximately 360,000 and the 6-times Pure (distributed through Pharmaprix stores) has approximately 70,000. Last year, its annual issue about innovation and new ideas was printed sideways, this year, Maclean's "Rethink" issue comes with 3D augmented reality. "In the spirit of rethinking the ordinary, this issue offers an entirely new way to enjoy the magazine that goes well beyond the printed word [says a release]. It uses a technology called "augmented reality (AR)." When certain pages are viewed through the camera on your computer webcam or smartphone, they will literally come to life, with audio, video and 3-D content." One of the augmented stories is about hockey player Sidney Crosby's brain, or rather the treatment he received for brain injury. Another is about"moose crosswalks" in Newfoundland, designed to keep cars from running into the animals, and vice versa. The pricing of lists of names from business and consumer magazines remain relatively flat, according to information released by list marketing firm Worldata. Its Fall 2011 results were reported by Audience Development magazine. While magazine lists stayed steady or declined slightly, b-to-c pricing of e-mail lists fell some 26% from fall 2010. National Geographic magazine, which in the summer struck a deal with the Apple store, this past weekend passed the 100,000 mark in paid digital subscriptions, according to a story in Folio:. 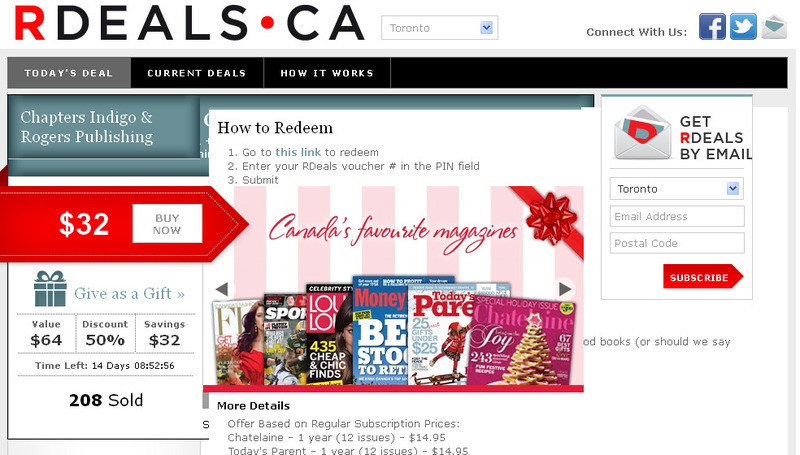 Magazines Canada has launched a promotional print campaign to celebrate the diversity of Canadian magazines. The campaign, designed by doug & serge, underpins the ongoing Genuine Canadian promotion and it will appear in Canadian magazines and in retail outlets across the country with iconic images formed by mosaics drawn from thousands of Canadian titles. There are four, different images. The campaign was paid for with support of the government of Canada through the Canada Periodical Fund, the Ontario Media Development Corporation and the Canada Council. "Canada is such a distinctive country and there are so many wonderful Canadian magazines that reflect our own views, values and interests. 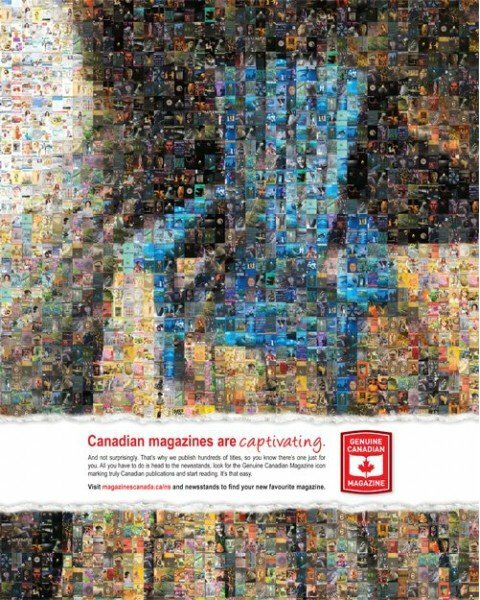 We challenged the doug & serge team to help us convey that Canadian magazines best reflect Canadians’ interests and perspectives because they are written by, for and about Canadians," said Barbara Bates, executive director, circulation marketing, Magazines Canada. "They have done a wonderful job of helping us to communicate that Canadian magazines are indeed a unique and relevant reflection of Canadians, and that the industry offers hundreds of titles."